Is Polished Concrete the Best Flooring Type? As a homeowner, you are continually choosing between what works best, and what costs the least. Sometimes those two requirements go hand in hand, while more often than not it’s a challenging decision to make. Nowhere is this a more difficult choice than comparing different flooring types. While they all have their benefits, there’s rarely a one-size-fits-all approach for your home. Polished concrete has continued to gain popularity in recent years, with many homeowners falling in love with its simplicity and durability. Best of all, its price is comparable to other flooring installations, making it a relatively easy house upgrade. Below are some of the benefits of polished concrete when compared to other materials. Once you’re ready to have it in your home, call Dallas Epoxy Pros for the best results possible. Tile and grout floors remain an ideal choice for kitchens, bathrooms, and even entire home interiors. They look great and perform well and can last a long time when cared for correctly. However, tile and grout are also notorious for trapping dirt, dust, and debris, even with weekly sweeping and mopping. Worst still is a direct impact from any number of items can quickly shatter at least one or more tiles with just one incident. Polished concrete remains naturally resistant to force, and they don’t trap in filthy mop water. You’ll find that surfaces not only remain simpler to clean, but they hold up far better against more daily hazards. Tiles can also become a hassle when trying to repair them, especially if it’s a single one in the middle of the room. If you need to avoid unsightly tile and resist more damage, polished concrete wins every time. Who doesn’t love walking through a home filled with smooth, even hardwood floors? In the early morning light, they look gorgeous day after day, and they offer less impact on your feet than other material types. Hardwood flooring also requires a dedicated subfloor to get installed first, which takes longer and costs more in labor and materials. Hardwood floors can easily scratch, chip, and splinter when you don’t regularly wax them. When you go for polished concrete floors, the starting surface already remains in place. Your service provider sands and buffs the bare concrete slab, transforming it into your new surfaces. Although hardwood does feel more comfortable to walk on, you don’t have to worry about replacing floorboards or running into moldy subfloors. Polished concrete stands up better and lasts longer than hardwood, giving it the edge on every job. Carpet has long been a favorited flooring material type for its soft textures, noise reduction qualities, and variety of colors and fiber blends. You can also find quality carpets for not a lot of money, making them an attractive purchase option. However, the paddings and fiber also soon get clogged with allergens, animal dander, and even mold and mildew spores. Even if you clean carpets every week with vacuuming, it won’t be enough to get rid of all its contaminants. Dirty carpets lead to smelly homes, which is most evident in homes that have pets. Polished concrete, by comparison, remains naturally hypoallergenic, making for a healthier, fresher house for longer. There are no fibers for stains to adhere to, and there is no padding for odors and bacteria to stay inside. If you suffer from allergies or need to know your home is safe to live inside of, polished concrete should be your preferred choice. Some homeowners may dislike linoleum, but it certainly has its place among the most common preferences for many. Linoleum can mimic other material types, and it remains one of the most affordable flooring materials around. Newer linoleum has a wax surface coat that helps repel moisture and spills. The flooring materials are also often composite, although unless you find all-natural products, it might not be as sustainable as you thought. However, they require more upkeep, or else stains, scuffs, and dirt begins sticking to the surface, no matter how frequently you clean them. Polished concrete is a much more environmentally friendly material type, and they stay easier to clean. When linoleum becomes too wet, it begins to pop away from the floor and disintegrate. Concrete flooring holds up to more liquids and damage than any other floor types that you can find. Natural stone floors are about as comparable to polished concrete surfaces as you can get. They are also among the most expensive material types to purchase, making them challenging to find and harder to afford. Natural stone flooring primary gets used in upper-end homes and upgrading in a standard family-style home with them is likely not a sound investment. However, there is no denying that their appearance remains lovely for a long time with little maintenance from you. When pricing out stone floors, it’s going to get expensive fast. At a minimum cost, you can expect to shell out $20 per square foot, but that number can quickly skyrocket depending on what type of stone you want. As a comparison, even your most expensive polished concrete will top out around $7 a square foot, with average pricing running closer to $3. 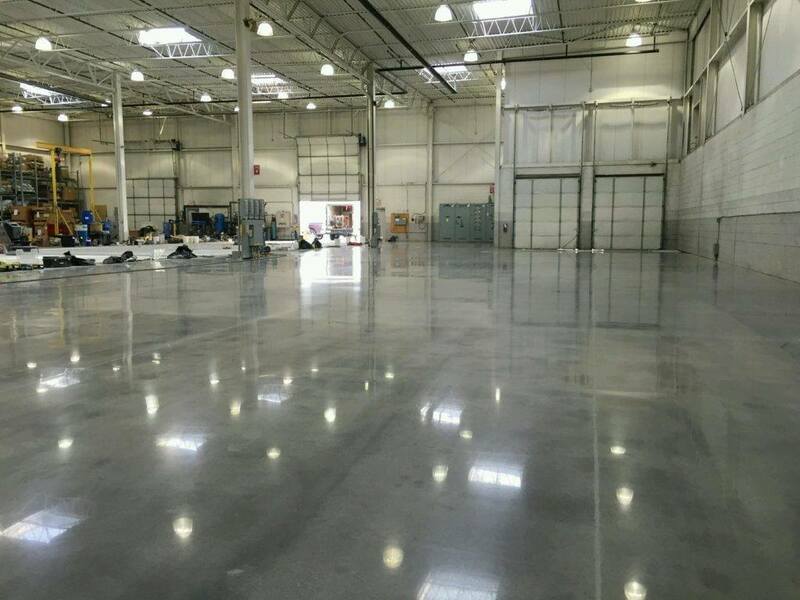 Polished concrete can also perform better and require even less maintenance, saving you more money in the end. One thing that sets polished concrete apart from the rest is just how uniquely customizable that they remain. Even if you were to have it installed throughout your entire home, you could change the styles and colors from one room to the next without much effort. 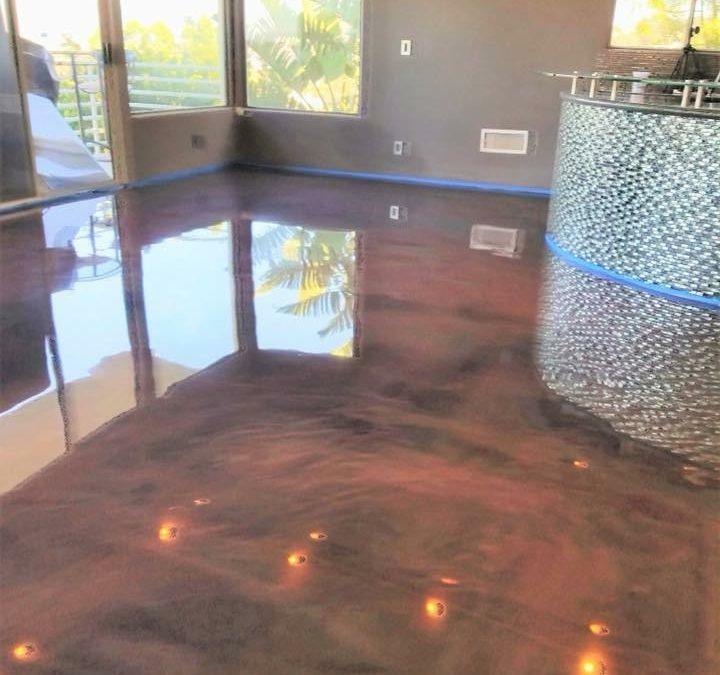 Stained concrete is very in now a days. Professional installation companies have access to a virtually unlimited number of colors, hues, textures, and other additives that they can apply. They can also mimic different surface types if you like the appearance of tile but prefer the durability of concrete. When you purchase flooring materials from a store, they likely only carry a handful of options for carpet, wood, and tile. Polished concrete has little to no limitations, and you can even use it with patterns. No two polished concrete floors ever need to appear the same, and some flakes can also increase your flooring’s slip resistance. If you want a floor system unlike anyone else on your street, you need polished concrete now. One of the most significant expenses involved with flooring is that some simply wear out faster than other materials. Each flooring type has a shelf life, ranging from a few years to a few decades. However, most floors don’t last as long as they get estimated to, because your life is more hectic than a display showroom. When you have children, pets, and are constantly chasing after them, you’re putting a ton of wear and tear on your floors. Polished concrete looks, and feels, almost invulnerable, withstanding direct impacts from heavy objects with little to no damage at all. Unlike hardwood, it doesn’t scratch, and they won’t crack under pressure like tile. Even if your carpet lasts for two decades, it will likely be disgusting by the time you rip it out. Polished concrete has nowhere for dust and debris to adhere to, and it’s naturally resistant to mold and mildew growth. DId you find this article helpful? Kindly check out our website Dallas epoxy pros or read our previous blog about the importance of epoxy garage flooring done right!